This cool sculpture is a piece of art designed by Danish artist Olafur Eliasson, which the office workers of global accounting firm KPMG in Munich can enjoy on their way in to work. 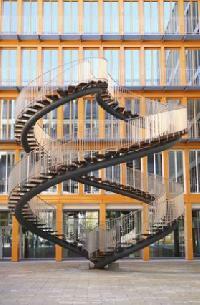 The architectural staircase, called Umschreibung (Rewriting), is a nine metre high double spiral of sleek steel. While it doesnt actually lead to anywhere and cannot be climbed, it makes for a great view especially when looking for a distraction from work. This impressive staircase can be found in Melk Abbey, one of the worlds most famous monastic sites located above the town of Melk and overlooking the river Danube. The rooms of the castle turned monastery contain permanent exhibitions and visitors come from all over the world to browse its ornate library and famous frescoes by Paul Troger. 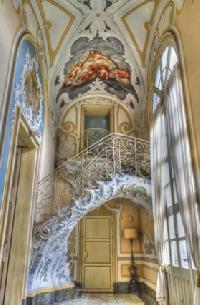 Dont miss the marble hall, a stunning example of Baroque architecture. The famous Chand Baori step well in the village of Abhaneri in Rajasthan, India, is one of the countrys architectural wonders and one of the most intriguing staircases in the world. The step well is located opposite Harshat Mata Temple and was built in the ninth century with 3,500 narrow steps and 13 stories. With a depth of 100ft, it is the deepest step well in India and was constructed to try to solve the problem of water shortages in Rajasthan. One of the most exquisite bookshops in the world, Livrario Lello in the Portuguese city of Porto is home to this lavish red staircase, making its interior as stunning as its incredible Art Nouveau and Gothic Revival facade. Lello is one of the oldest bookshops in Portugal and opened in 1901. While the staircase is its centrepiece, with carved wooden banisters and glossy red steps, the shop also features a marvellous stained glass ceiling and ornate wooden shelves holding books from every era and genre. 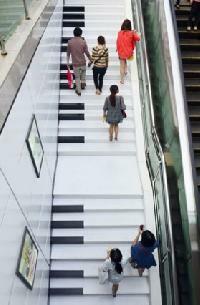 Chinas piano style stairs built at Wulin Plaza in Hangzhou make the appropriate musical notes when stood on. The 54 steps were installed to encourage people to walk instead of lazily take the escalator. The only problem could be too much noise if everyone starts taking the stairs. 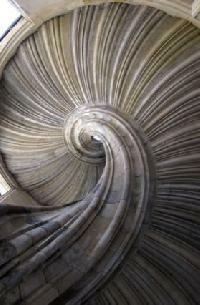 The wonderful staircase at Hartenfels Castle dates back to the 16th century and resembles a snails shell. During East German times it had to be closed to the public due to its decaying condition and in 1991 the first plans were initiated to restore the intriguing stairway made from sandstone and consisting of 53 steps. The stairs are around 20 metres high and are situated in the inner courtyard of the castle in Torgau. 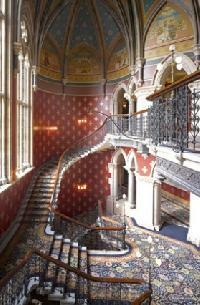 The Grand Staircase within the St Pancras Renaissance London Hotel is known as one of Europes grandest stairways and is among the most beautiful hotel staircases in the world. It has been the backdrop to films, such as Batman Returns, and the Spice Girls music video for the song Wannabe. Blessed with a cathedral like ceiling thanks to Sir Gilbert Scotts design it is now a stairway to explore and discover the Victorian age of industry and commerce. It may look like a rollercoaster but this unusual sculpture is in fact a staircase stretched through all kinds of curves. Located in Duisburg, Germany, the Tiger & Turtle Magic Mountain sculpture is the creation of German artists Heike Mutter and Ulrich Genth. The interactive sculpture features 249 steps for visitors to explore in the day, when they can take in the views above the Rhine, and at night when the LED lights on the handrails illuminate the staircase. The loop is the only part that cannot be climbed and is closed off by a barrier. This Brazilian masterpiece in Rio is the work of Chilean born artist Jorge Selaron who considers it as a personal tribute to the Brazilian people. 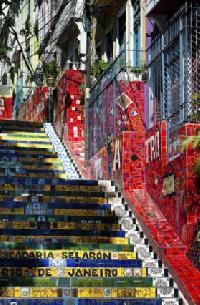 Selarons Stairs, a mosaic staircase made from vibrant yellow, green and blue tiles inspired by the Brazilian flag, connects the neighbourhoods of Santa Teresa and Lapa. The staircase consists of 250 steps and measures 125m long. Selaron began work on the stairway in 1990, creating a constantly evolving piece of art, which now has over 2,000 brightly coloured tiles collected from over 60 countries. The 65 year old claims this crazy and unique dream will only end on the day of my death.